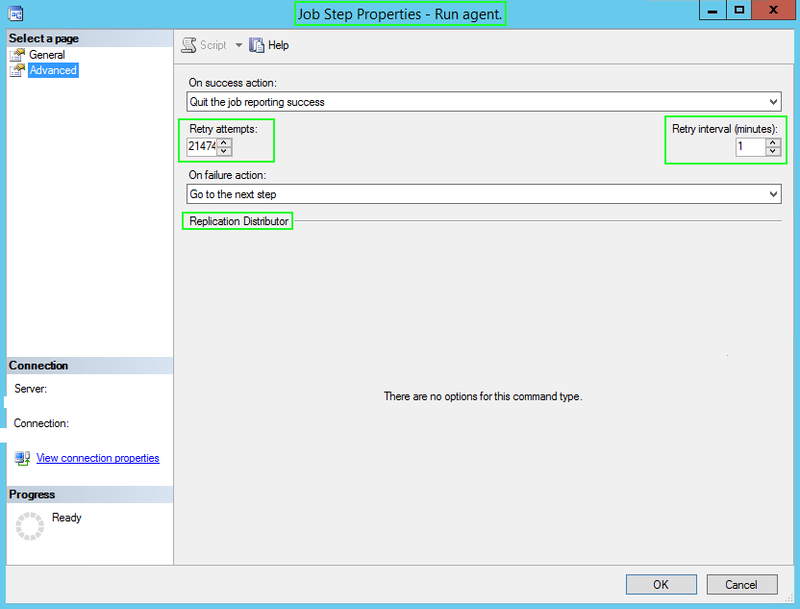 "Agent SQLNYC01-Onvoices-PubInvoicesInvoices-SQLNYC01-1353 is retrying after an error. 211 retries attempted. See agent job history in the Jobs folder for more details." Question #1: How many times will the Distribution Agent(s) SQL Job(s) retry with Transactional Replication set to continuous delivery? that many retry's to happen. "18854	One or more subscriptions have been marked inactive. Drop and re-create all subscriptions for this node that are failing with this error." "The subscription(s) have been marked inactive and must be reinitialized. NoSync subscriptions will need to be dropped and recreated. (Source: MSSQLServer, Error number: 21074"
Note the actual changes occur when this SQL Job executes: "Distribution clean up: distribution"
Question #3: How to monitor for breaking errors occurring in the Replication system? First, those errors above are obviously something you do not want to occur. You need to actively monitor for the various issues with Transactional Replication and below are two errors to watch out for. It a good idea to setup SQL Jobs to monitor, log AND alert on certain errors and to fix those immediately to avoid a Subscription becoming inactive. 20598 - The row was not found at the Subscriber when applying the replicated command. 2627 - Violation of PRIMARY KEY constraint ‘PK_TBL’. Cannot insert duplicate key in object ‘dbo.TBL’. Question #4: Are there any other Retention periods in Transactional Replication? Yes! And it is called "Publication Retention Period". 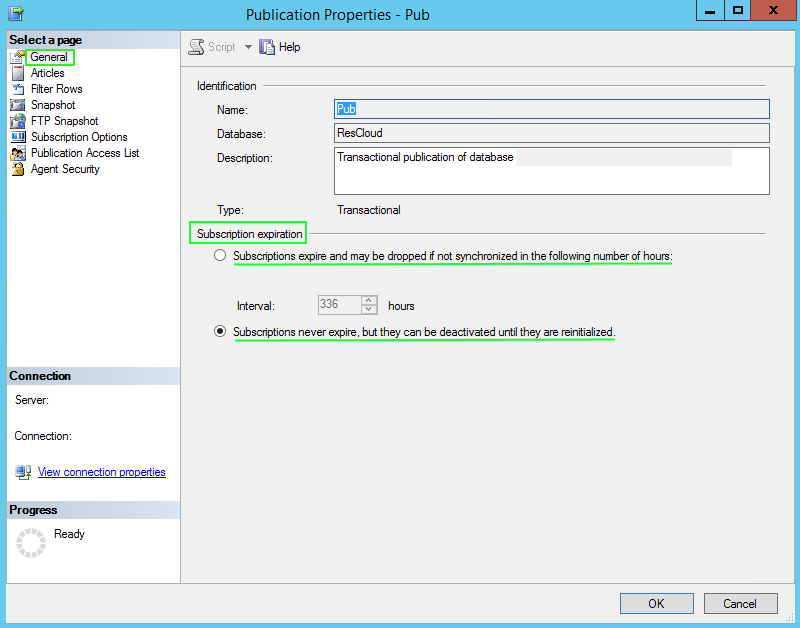 To find this setting navigate to SSMS, Replication, Local Publications, right-click on a Publication and select Properties. Then the General tab find Subscription expiration section. The below screenshot explains it really well. If a subscription is not synchronized within the maximum distribution retention period (default of 72 hours) and there are changes in the distribution database that have not been delivered to the Subscriber, the subscription will be marked deactivated by the Distribution clean up job that runs on the Distributor. The subscription must be reinitialized. If a subscription is not synchronized within the publication retention period (default of 336 hours), the subscription will expire and be dropped by the Expired subscription clean up job that runs on the Publisher. The subscription must be recreated and synchronized. If a push subscription expires, it is completely removed, but pull subscriptions are not. You must clean up pull subscriptions at the Subscriber. For more information, see Delete a Pull Subscription."